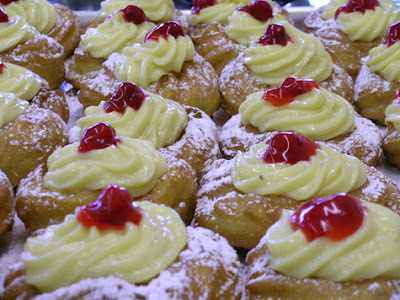 Whispers in the Loggia: Festina Zeppole! Oh St. Joseph, whose protection is so great, so strong, so prompt before the throne of God, I place in you all my interest and desires. Oh St. Joseph, do asssist me by your powerful intercession, and obtain for me from your divine Son all spiritual blessings, through Jesus Christ, our Lord. So that, having engaged here below your heavenly power, I may offer my thanksgiving and homage to the most loving of Fathers. Oh St. Joseph, I never weary contemplating you, and Jesus asleep in your arms; I dare not approach while He reposes near your heart. Press Him in my name and kiss His fine head for me, and ask him to return the Kiss when I draw my dying breath. 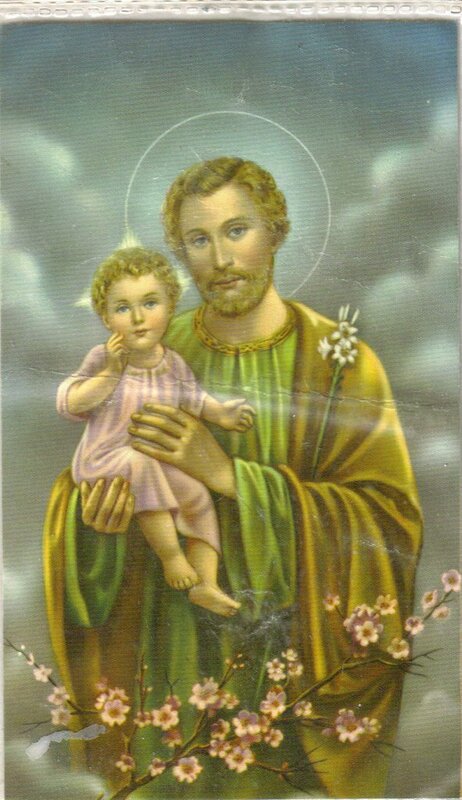 St. Joseph, Patron of departing souls, pray for me. In the little corner of the world where I was raised -- somewhere, I pray, you'll all get to experience at some point (if, for no other reason, to find that everything you see on The Sopranos is, indeed, real) -- the leitmotif of this onomastico of the patron of the universal church isn't so much marked by thoughts of the wider communion or statues buried upside-down in front of houses on the market, but queues out the bakery doors for the once-a-year goodies known as zeppoli, the St Joseph's Cakes. Leave it to the Italians -- smack in the midst of Lent, these things are downright sinful. Then again, such is the love our people have for the Lord's foster-father that you'd think (and, no lie, some really do) that he was born somewhere in Abruzzi. We're assimilated enough here that we don't do the custom of saint's days to the extent they do over in the Old Country, but there I was, sitting around the Boss' table earlier today with la suprema, herself, a gaggle of aunts and my Uncle Joe -- my confirmation sponsor, whose name I took -- stuffing my face with the goodness. "Why did you bring a whole box?" my aunt was asked. "Rocky'll eat 'em -- just watch," she said. As you know, I always try to meet the expectations of others. Rarely, however, is it as enjoyable as this. God love him, my second godfather -- one of the most patient, humble, generous people God's ever gifted the earth with, so good that my father keeps telling him that he's gonna get taken up "body and soul" when his day comes -- has diabetes, and he's not terribly keen on his patronal treats to begin with. But every year without fail, the people of his parish, neighbors, former co-workers, the old ladies he drives to doctor's appointments, etc., all bombard his house with string-wrapped box after string-wrapped box of the Joemas treats. It's always my custom to visit... and then start chipping away at the intake. This year, the venue was moved, and my grandmother asked me after Unc left why I didn't remind her that it was her first son-in-law's name day when he was there. So we were treated to ten minutes of "Now you tell me?!" And then, as she does, she forgot that she forgot and began to pride herself on remembering that she wished him a happy St Joe's. "See, I don't forget everything." With stories like that, hopefully you see why I don't like staying on the road for too long. Now that we've all made our annual donation to Varallo's -- the bakery whose owners literally got to have their cake and eat it, too, buying up 12 rowhouse lots across two streets to build a full-sized villa in a sea of rowhouses (complete with Padre Pio shrine) -- the coast to Holy Week is clear. Almost, that is; the solemnity of the Annunciation is still at hand... albeit on a delay. As 25 March falls on a Sunday this year and nothing overtakes the Sundays of Lent, the Lord's conception is getting bumped back to the 26th. Coupled with today's observance missing its first vespers in light of the Sunday precedence and next week's doing the same, by force of rubric 2007's mid-Lent celebrations are a bit more subdued... not to mention that we haven't come up with an Annunciation Day pastry. Still, it could be worse -- there are those years (rare though they are) when the Annunziata's proper date falls in Holy W eek and our Savior's gestation calendar gets completely thrown off. In those cases, the solemnity is pushed all the way back to the Monday of the Second Week of Easter. Of course, though, the Gift of Gifts still arrives in time for the end of the December shopping season. 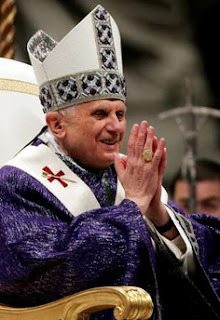 Buon onomastico, Santo Padre -- Blessed Joemas to all! "Why Am I Always On a Plane or a Fast Train?" "Take a Deep Breath. Not You -- Me." Niente Penalitá: Rise of the Kinder, Gentler CDF?